The year is 1928. Jazz is hot, bootleg liquor is king and the idle rich of a nation have discovered a horrifying new past time: summoning demons! To combat this growing threat, a new order of Holy Warriors has arisen. This is the story of Sister Rosette, an elite Exorcist in the Order of Magdalene, whose soul has been bound by alchemy to that of the devil Chrono. Armed with Sacred ammo, Rosette and Chrono form an unstoppable team, ready to wage war at a moments notice... because when the gates of hell are opened, someone has to put the devils back! 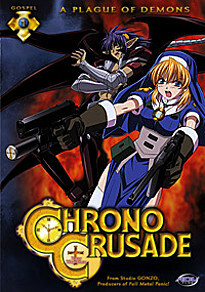 DVD Features: clean opening and closing animation, production sketches, Azmaria's Extras Classes video, commentary with Hilary Haag (Rosette) and Greg Ayres (Chrono), original on-air openings, Chrono Crusade Chronicle, and previews.